See how HR and business leaders are managing comp in their organizations, from salary increase budgets to variable pay to compensation communication. The overarching theme for the 2019 Compensation Best Practices Report is centered around the idea that it’s becoming increasingly challenging to attract and retain employees in today’s tight job market. 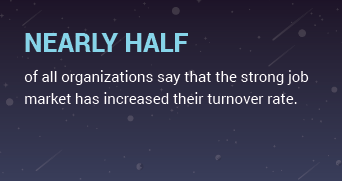 This year, we find that nearly half of employers agree that the strong job market has increased their turnover rates. 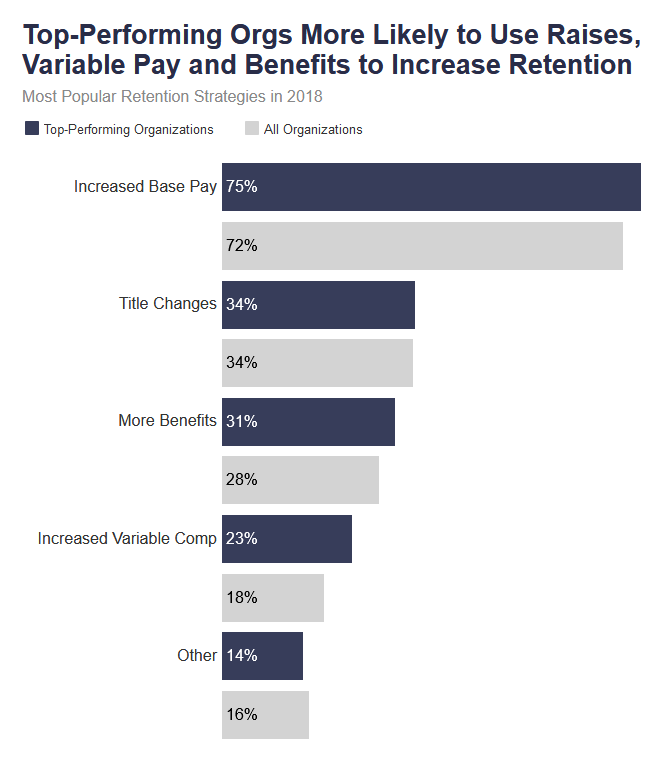 Meanwhile, retention tops the list of reasons for why organizations adjust their compensation strategy. To keep employees onboard in this market, it’s not enough to focus on any single element — you’ll need to get creative with every lever you have in the total rewards mix to motivate the behaviors and results you desire. In this tight talent market, even more organizations (66 percent) called out employee retention as a major concern, compared to 59 percent for 2018. A whopping 47 percent of human resource and business leaders– the largest proportion for any answer option — say that the strong job market has increased their turnover rate. Yet, despite concerns around holding onto talent, HR and business leaders are not planning to address attrition by increasing their base pay budget. While 85 percent of organizations plan base pay increases in 2019, the average pay raise isn’t expected to change much from 2018, with 69 percent of employers estimating an average of 3 percent or less. However, organizations do intend to reward high performers differently than typical performers. The highest base pay increase given to an employee (excluding promotions) was greater than 10 percent for 42 percent of all organizations. 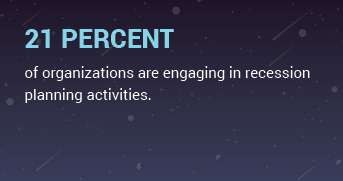 Eighteen percent of organizations gave at least one increase in the 10-14.99 percent range. Almost 10 percent gave an increase of 20 to 30 percent! Although organizations still rely heavily on traditional benefits such as employer paid medical, dental and vision insurance and retirement plans, they’re venturing beyond these staples in their quest to keep good employees onboard. Many organizations have started to see that work-life balance is an attractive benefit. In 2018, we find that 38 percent of organizations offer flex-time, 32 percent provide paid family-leave, and 10 percent allow employees to work a 4-day work week. Additionally, we saw accrued or granted PTO, sick leave and remote work gaining popularity. 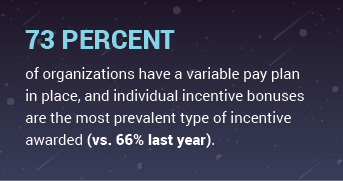 Although the number of organizations offering unlimited PTO is still relatively low, we’ve seen this benefit double in prevalence within the last two years. For 2019, we expect to see continued growth in benefits that enhance employees’ financial, physical, and emotional/social well-being. Most HR and business leaders aspire to move up the pay transparency spectrum in 2019. 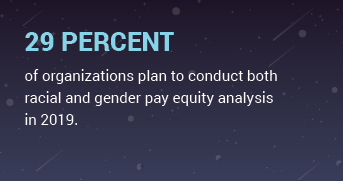 Twenty-eight percent of all organizations plan to share pay ranges with individual employees (level 3); 23 percent plan to reach a place where their comp plan reflects the organization’s culture and drives talent strategy (level 4) and 8 percent aspire to make ranges and employee pay information available to all employees (level 5). However, most organizations are still hesitant to reveal the details to their employees. Just over a third of all organizations (36 percent) report that they share pay ranges with their employees for their position. Additionally, 38 percent of employers report that their employees know where they fall within the range. Just 32 percent share market data with their employees when giving rationale for a raise. Your pay brand is what employees and candidates believe to be true about your organization’s pay practices. It’s shaped by what employees say to others about your compensation practices and their experience of working at your organization. Our research shows that organizations with a strong pay brand have more satisfied employees and smaller gaps in perception between employees and management when it comes to key workplace issues. In order to develop a strong pay brand, you’ll want to have a clear compensation philosophy that outlines what you pay, how you pay and why you pay the way you do. It’s also about being strategic in how you communicate pay decisions with employees. When employees understand how pay decisions are made, they’re more likely to believe they’re fairly paid and stay engaged. This year, we find that most organizations are still grappling with how to develop a strong pay brand. Forty percent of all organizations like the pay brand they have; a slightly larger group (41 percent) say their pay brand is neither good nor bad; 19 percent deem their pay brand to be bad or very bad among their own employees. When we asked respondents to describe their pay brand, many answers reflected a desire for improvement. For example, some mentioned they don’t have a pay brand yet. Some emphasized a desire to improve pay transparency, others commented that their pay brand is inconsistent among different business units. Still, others talked about the difficulties of getting management buy-in to change their pay practices. The 2019 Compensation Best Practices Survey gathered responses during November and December 2018. There were 7,030 respondents included in this survey. Looking for the 2019 Compensation Best Practices Report – Canada Edition? Get your copy here. The 2019 Compensation Best Practices Survey gathered responses during November and December 2018. There were 7,030 respondents. Top-performing organizations are defined as those who are number one in their industry and exceed their revenue goals in 2018. Twenty-three percent of respondents fit these criteria. Respondents spanned the globe, including 5433 respondents in the United States and 584 respondents in Canada. Organizations with both single and multiple locations were represented. We defined four organizational sizes for comparison as follows: Small (1-99 employees), Mid (100-747 employees), Large (750-4,999 employees) and Enterprise (5,000 or more employees). Under half of the respondents reflect small organizations; around 1400 respondents come from organizations large and enterprise organizations. As in prior years, the top industries represented in the survey were technology, Healthcare, Manufacturing and Nonprofit. 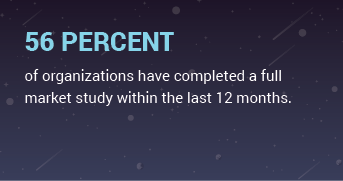 In terms of organization type, most respondents were either from a public company, a private company or a nonprofit (86 percent), but we also have respondents from government, schools, higher ed, hospitals, cooperatives and trade associations. Most respondents identified at the Manager level (33 percent). 25 percent identified as Individual Contributors, 23 percent identified as Directors, and 20 percent identified as Vice Presidents of C-level executives.